One of the things that makes fundraising with World's Finest® Chocolate so unique is the level of service and attention we provide to our customers. This is accomplished through our dedicated Fundraising Specialists, an elite team of World's Finest Chocolate experts located throughout the country, assigned to serve you at no additional costs. Our Fundraising Specialists' mission is to help you design the perfect fundraising program. They keep up with the latest and greatest fundraising ideas, trends, and preferences in order to ensure success. Whether you're a seasoned fundraising veteran or a first-time volunteer, working with a WFC Fundraising Specialist can provide many benefits. Our Fundraising Specialists know the chocolate fundraising business inside and out. Through our extensive training and development program, our Fundraising Specialists learn best practices, industry standards, and fundraising methods that work. They will help you prioritize goals, stick to them, keep deadlines, and measure your success. Not only are our Fundraising Specialists experts in World's Finest® Chocolate, but they are also experts in your particular region. They know the best selling products and fundraising strategies in your area and can use insights from previous fundraisers to help you make informed decisions. Our Fundraising Specialists want to exceed your fundraising goals and expectations. They often offer prize incentives or special price promotions to help you make the most out of your fundraiser. A fresh pair of eyes can bring much-needed clarity to your organization. Our Fundraising Specialists will help you examine and understand the strengths and weaknesses of your previous fundraising plans and execution. With a better understanding of your individual needs, a Fundraising Specialist can design a program that works for your organization. 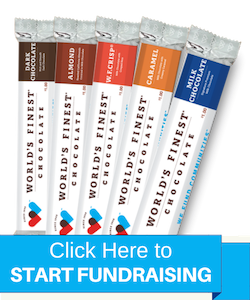 Managing a fundraiser takes effort and coordination, which is why World's Finest® Chocolate strives to provide the easiest fundraising solution in the shortest amount of time. Fundraising Specialists want your program to be successful just as much as you do and can assist you from start to finish. Our hands-on fundraising specialists at World’s Finest® Chocolate partner with you to ensure fundraising success for your group. They help you determine the right product, quantity, timing, and incentives to reach your goals. They are passionate about fundraising and are determined to set you up for success. One of the major benefits of working with a WFC fundraising specialist is the ability to customize your WFC fundraising product with your group’s name, logo, photo, and fundraising message. You can even choose your own custom mix of chocolate flavors within the fundraising boxes to make it uniquely yours! Minimum order sizes and lead time apply to this type of personalization. Ask your fundraising specialist about personalization; he/she can walk you through all the specifics.